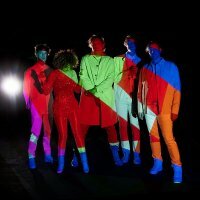 Currently perched at the top of the album-charts in the UK and Ireland with the album "The Suburbs", Arcade Fire have announced a series of big-venue concerts around the UK in addition to their appearances at Reading, Leeds and Oxegen. The confirmed dates are London's O2 Arena on 1st December, Birmingham on the 8th, Cardiff on the 9th, Manchester on the 11th and Glasgow on the 12th with all tickets going on sale at 9am this Friday (13th - lucky for you, eh?). Support for the tour comes from the rather excellent Devendra Banhart. Tickets will cost £27.50 for Birmingham, Cardiff, Manchester and Glasgow, £30 for London and demand will be immense. Arcade Fire's last visit to London was at the intimate Hackney Empire, but the band have also recently played at Madison Square Gardens, with much of the footage filmed for online streaming - I smell a DVD-release in the not too distant future. Meanwhile the band's title-track had racked up 200,000 hits in just a few weeks, a pre-cursor to the inevitable number one spot they currently hold. The previous albums, "Neon Bible" and "Funeral", will no doubt make up a considerable chunk of the upcoming setlists. Update - second O2 date added! The band have today (Friday 13th August) just added a second date at the O2 arena. Tickets cost £30 + fees - on sale now.